Each year, C-Clear Partners is attending the annual Salesforce event ‘Dreamforce’ in San Francisco. It is the biggest Salesforce event in the world, with over 2,700 sessions to immerse yourself in all the innovation Dreamforce has to offer. These sessions include hands on workshops, keynotes, round tables and other activities and features inspiring visionaries and top CEOs such as former Vice President of the United States Al Gore, Drew Houston (Dropbox), Dara Khosrowshahi (Uber), Dion Weisler (HP Inc.), Brian Gallagher (United Way Worldwide) and many, many more. It is the go-to destination for every industry, giving a view of the world of work – and the future. It wouldn’t surprise you that I was very excited! A couple of weeks before the actual event I started planning my agenda. Salesforce provides you with an Agenda Builder to help you find all the content that you are most interested in at Dreamforce. With Agenda Builder, you can see all the sessions filtered by Categories, Industries, Themes, Roles, Products and personal experience level. Trust me, a tool like this is what you need when you want to plan your schedule with over 2,700 possible sessions to attend. I started saving, bookmarking and registering for sessions that I wanted to attend at Dreamforce, keeping in mind what I wanted to focus on (Health Cloud, Healthcare and Pharmaceuticals, Service Cloud and Field Service Lightning). Throughout Dreamforce the Salesforce event app allowed me to access my personalized schedule so I knew just where I needed to be each minute of the conference. Of course, I also left some time to attend other sessions or just discover all the wonderful moments and activities happening all over the Dreamforce campus. Of we were! Early Saturday morning I met up with Hélène, Sam and Geert to carpool to Amsterdam and aboard our flight to San Francisco. By the time we arrived, unpacked our bags and picked up Kasim who was on another flight, it was already evening. Luckily, we already bought tickets to see an NHL game of The San Jose Sharks. It was a fun evening in good company where we got a taste of a typical American sport event. It also was a perfect way to postpone our jetlag ! The next days we had a chance to discover the beautiful city of San Francisco. After an energizing bagel breakfast, we were ready to conquer the Golden Gate bridge! 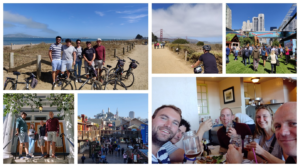 We went to Pier 39 to rent a bike from Blazing Saddles Bike Rental and after one of the many detailed safety instructions we received in the States, we headed towards the Golden Gate Bridge. It was a perfect day to enjoy San Francisco: sunny weather combined with a nice bike ride through the city parks and next to the waterside. We crossed the Golden Gate Bridge and made our decent to Sausalito, a cozy small town in the San Francisco Bay to grab something to eat. After a nice lunch we took the ferry back to San Francisco and enjoyed the remainder of the day walking around in the Pier 39 area, spotting the famous sea lions and wrapped up with a nice dinner. On Monday we picked up our badges for Dreamforce and strolled around the city, looking for some shopping deals and admiring the buildings of the financial district. In the evening we had diner at the Bubba Gump company, a shrimp restaurant fully decorated with Forest Gump references, and went to bed early so we would be fully charged for our first day at Dreamforce. Wow, what an experience it has been. The amount of sessions and the decorations of the entire campus just blow you away. Dreamforce offers you a chance to learn, get certified, get hands-on experience, network, share your experiences and connect with partners but it is about so much more than that. Marc Benioff didn’t mention any Salesforce product once during his speech. His only goal was to inspire everyone to integrate philanthropy into their daily lives and their business. The do-good and feel-good spirit is present throughout Dreamforce with opportunities to give back on-site every day of the conference. Not only has Dreamforce become the largest nonprofit technology conference in the world, but it also helps turn the whole Salesforce community into philanthropists. This year, Salesforce launched Philanthropy Cloud, which connects corporate employees and nonprofits in a new digital marketplace for doing good. Salesforce organizes a benefit concert called ‘Dreamfest’ to support the UCSF Benioff Children’s Hospitals. After Dreamforce, Salesforce announced $18 million in grants to local school districts and organizations to address the Bay Area’s most pressing issues including public education, homelessness and cleanliness. Former Vice President Al Gore spoke about climate change and the inspiration kept on flowing as leaders from Uber, ABB, HP, Apple, and many others took the stage to celebrate how they are paving the way for a brighter, more connected future. Even the little things can make a difference such as 100% compostable lunch packaging, giving everyone a refillable water bottle and a 100% offset of onsite water usage, carbon emissions, and employee travel to the event. Dreamforce does it’s best to conserve resources, source responsibly, reduce waste, and most importantly: inspire attendees to do the same. I for sure was inspired and was happy that I could easily relate to what Marc Benioff was saying. At C-Clear Partners we do our best to give back to the community, be sustainable and share this vision across all colleagues. Just this summer we all put an effort in to paint the rooms of disadvantaged children and this Friday we will have our yearly charity party. I am happy to be part of a company that takes a moment to think about more than just business and encourages their employees to do the same. Everyone attending Dreamforce will get the opportunity to make the world a better place, enjoy the goods that San Francisco has to offer and rock out to Metallica or dance along with Janet Jackson, but of course Salesforce is the main reason everyone is attending Dreamforce. Let’s have a closer look at the hot topics of Dreamforce 2018. Conversationally update Salesforce: Einstein Voice Assistant allows users to simply dictate updates directly in the Salesforce Mobile App, removing the workload of repetitive administrative tasks. 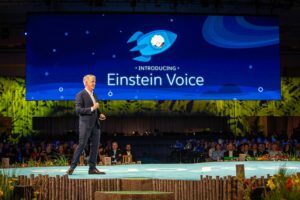 Einstein Voice Assistant will automatically transform unstructured voice data in action by updating Salesforce records, notifying team members and creating tasks. Get personalized Daily Briefings: Users will be able to receive a Daily Briefing of key Salesforce metrics and priorities through their preferred voice assistant. The Daily Briefings can be easily configured by admins to focus on what every user needs the most – from their schedule to their key opportunities to an overview of their team’s pipeline. Explore Salesforce dashboards: Voice commands will allow users to easily access critical information they need from Salesforce. Users can now pull up Einstein Analytics dashboards and drill to the detailed information instead of manually opening and filtering the dashboards. A sales manager could for example drill down to a pipeline dashboard filtered for a specific region during a pipeline review meeting. Build voice bots with clicks, not code: Admins will be able to quickly and easily build voice-powered bots that are connected to Salesforce in a matter of a few clicks and deploy them on the Google Assistant and Amazon Alexa. An Einstein Voice Bot could for example be deployed to enable customers to request booking information with a simple voice command. The Einstein Voice Bot would then look for the information that was requested and share verbal answers after which the customer could update their reservation by simply asking the Google Assistant or Alexa. Pretty exciting if you ask me! Integration is something that Salesforce has heavily invested in over the last 6 months. Connecting systems and different data sources remains a time-consuming challenge. In March, Salesforce announced Integration Cloud, after the acquisition of Mulesoft. Integration Cloud includes a set of services and tools that make it easy for customers to surface their data, regardless of where it resides. While MuleSoft will continue to build toward its vision of the application network with its Anypoint Platform, Salesforce admins can build a single view of the customer across all their Salesforce deployments as well as their entire network of business systems. Of course, this is all done with clicks, not code! This would for example allow to bring in historical order data into the Lightning Service Console, enabling service reps to really have the 360-degree view of their customers, without leaving the console. 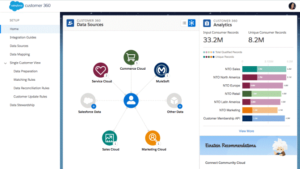 In an era where data connectivity is a given, stepping up in Integration is exactly what Salesforce needed. Customer 360 ID: a universal record ID that each system will associate with. Customer 360 Interface: an interface which allows admins to connect data from various sources in a few clicks. It includes data preparations, defining matching rules and a dashboard with metrics such as the total amount of customer records and the unique customer records (see picture). As a result, Salesforce admins will be able to see the full picture of an individual customer with all attributes and an overview of different data sources of the records. There was never a shortage of big news and announcements at Dreamforce. From the launch of Salesforce Customer 360 and Einstein Voice to expanded partnerships with Apple and ABB (just to name a few), Dreamforce ‘18 was all about working together to connect to our customers in new and more engaging ways. And of course, Dreamforce wouldn’t be Dreamforce if it didn’t include a lot of fun! Each day was packed with plenty of side activities and every evening we had the chance to relax and share what we had learned. Whether this was having a nice BBQ on Tuesday, seeing Janet Jackson and Metallica perform on Wednesday or going to one of the many afterparties on Thursday, it was an inspiring, learningful and fun experience shared with amazing colleagues. A definite must for every Salesforce Consultant!